Eyeing to generate an updated and relevant RDE Agenda aligned to the thrusts and priority programs of national government agencies aimed towards achieving national and regional development goals, the Research, Extension and Training (RET) Unit of the Tarlac Agricultural University spearheaded the “RDE Seminar-Workshop: Planning of the TAU Research, Development and Extension (RDE) Agenda 2018 and Framing of Winning Research and Extension Program Proposals” on April 12, 13 and 20 at the TAU Hostel Conference Hall and Farmers’ Training Center, respectively. The first day of the activity highlighted the updating of a relevant, responsive, and sustainable TAU RDE Agenda wherein Dr. William D. Dar, former Director General of the International Crops Research Institute for the Semi-Arid Tropics (ICRISAT) and the founder and incumbent president of InangLupa Movement that advocates agricultural modernization and rural industrialization, served as the guest speaker. The Research, Extension and Training (RET) Services of Tarlac Agricultural University is now International Organization of Standardization (ISO) certified after Ms. Mary Glory Caunin, auditor of the Russian Register, awarded the ISO 9001:2015 Quality Management System (QMS) Certification to the TAU-RET QMS Core Group headed by Dr. Tessie E. Navarro, the Vice President for Research, Extension and Training (RET) Services on February 9, 2018 at the TAU Agritourism Hostel Function Hall. After receiving the ISO certification, Dr. Max P. Guillermo, commended the QMS Core Group for achieving another milestone for the University. He added that earning this prestigious award does not mean an end of a journey; instead this signifies the continuous challenge in sustaining the excellence and integrity in service they provide for their clienteles and stakeholders. 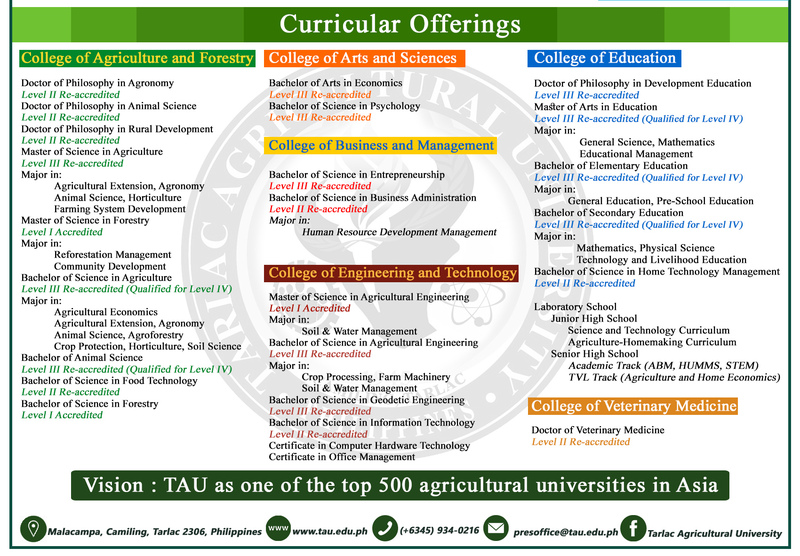 A year after the enactment of Republic Act 10800, An Act Converting the Tarlac College of Agriculture in the Municipality of Camiling in the Province of Tarlac into a State University to be known as the Tarlac Agricultural University (TAU), the TAU community is overjoyed in celebration of its first University Charter Day Anniversary on May 10, 2017. With the theme “Celebrating TAU’s 1st University Charter Day Anniversary: Aiming Higher for Excellence, Integrity and Service,” programs such as Thanksgiving Mass, Clean Up Drive and University Fiesta, Thanksgiving Program and Fellowship Night were lined-up to commemorate and acknowledge the efforts given by the TAU community and stakeholders in its ambition to become a university. Along with this, cooperating agencies and community partners of the university were awarded plaques and certificates for their support and assistance in the academic and institutional endeavors of the University. Senator Paolo Benigno “Bam” A. Aquino IV, Former Congressman Roman T. Romulo, Dr. Ruperto S. Sangalang and Mr. Mark Jayson Megriňo, outgoing members of the TAU Board of Regents formerly known as TCA Board of Trustees, were also given Plaques of Appreciation in recognition of their invaluable contributions in the development of TAU.